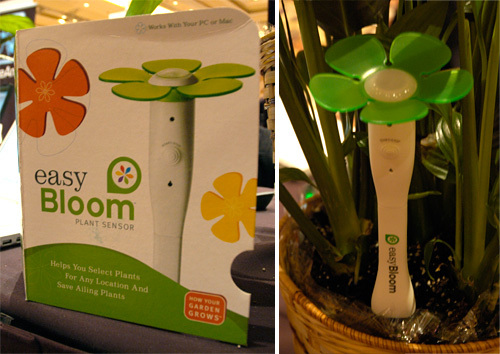 [CES 2009] EasyBloom Plant Sensor Guarantees You A Green Thumb | OhGizmo! Amongst the endless forest of LED/OLED/Plasma TVs and of course netbooks, you occasionally stumble across something genuinely unique and original at CES. And today I was quite happy to discover the EasyBloom just before I headed back to OG HQ. But don’t let the cartoony flower design mislead you, this thing is one clever piece of tech. Before you actually plant your garden or even decide what flora to buy, you stick the top section of the EasyBloom in the ground where you intend your garden to be. Over the next 24 hours it will record the environmental conditions in that location including available sunlight, soil conditions, moisture and temperature, and that data is then synced with the company’s website where you’ll be provided with a list of what plants will grow best in those conditions. And once your garden is planted, you can use the EasyBloom again to keep track of the soil conditions to let you know if you’ve been over or under-watering, or what you can do to improve the health of your plants if things aren’t growing as well as you’d hoped. Best of all, unlike many things at CES, the EasyBloom is available now for $59.95. That's cute and very amazing product!! !